Give us a call: 540-869-4050 Open Tuesday-Sunday, 9AM-5PM. Shenandoah sheds is a full service barn builder. We deliver right to your site. Shenandoah Sheds offers site prep and excavation services at competitive prices. Choose your perfect shed and Shenandoah Sheds will deliver it right to your site. Shenandoah Sheds also builds custom sheds and barns on site. Shenandoah Sheds is owned by Gary and Barb of White Post, Virginia. Years ago, Gary and Barb were in the market for a shed for their property. Disappointed by the high prices and low quality options in the area, they decided to open a shed business of their own. 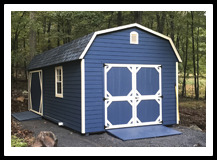 Shenandoah Sheds was born and now supplies the Shenandoah Valley with the highest quality, lowest priced storage solutions around. Shenandoah Sheds sells Amish Made Run-In Sheds, Row Barns, Quaker Sheds, Mini Barn Sheds, Barn Sheds, A-Frames and Custom-Built barns. Based in White Post, Virginia, Shenandoah Sheds serves the entire Shenandoah Valley including Clarke County, Frederick County, Shenandoah County, Loudoun County, Fauquier County, Warren County, and more. Shenandoah Sheds will also deliver to West Virginia, Maryland and the DC metro area.